Back home and post Easter I was in need of some healthier living. Healthy but tasty. I find the key for me is organisation there can't be any fridge or pantry gazing, aimlessly wondering what I will rustle up as that seems to inevitably lead me down a less healthy, ultimately less satisfying route. For me it also means I need go to snacks at work to avoid the jar of biscuits in the kitchen. It does require a little forward planning but worth it in the end. Plus with the shorter days overwhelming cravings for comfort and carb laden food become more frequent and for me one of my weaknesses is always the lure of a packet of potato chips, salty, crispy fried deliciousness. 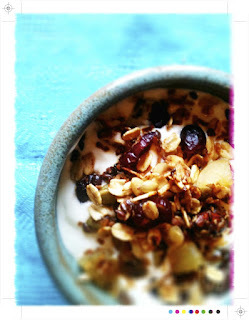 So to stave off these indulgences for my afternoon snack I like a little fruit and yoghurt, on its own healthy and virtuous and not enough to quell my desire for potato chips, but topped with a little homemade granola it tides me over until dinner. Crunchy, fruity and a little sweet with some berries and a dollop of creamy Greek yoghurt you certainly don't feel like you are being over virtuous, which I find with food can often equate to unsatisfied and then a dip in to that bag of potato chips. 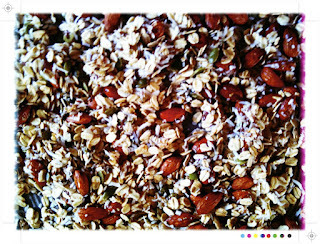 For my granola I took inspiration from In Jennie's Kitchen, a great blog which you should check out if you haven't. What I liked about it was replacing the butter with olive oil and honey. Healthier, yes but sacrifices no flavour. You can mix it up with whatever fruit, nuts and spices that you like or have on hand in the pantry. Place the oats, almonds, pumpkin seeds, flax seeds, coconut, salt and cinnamon in to bowl and stir to mix everything together. Pour in the honey and olive oil, and stir everything together, it will clump together a little bit, but just keep mixing until it is all evenly coated. Spread the granola in a thin layer onto a baking tray and bake for 35-40 minutes. Give it a bit of a stir half way through baking. Remove the granola from the oven once it is toasty and golden. Add in the dried fruit and mix it through. 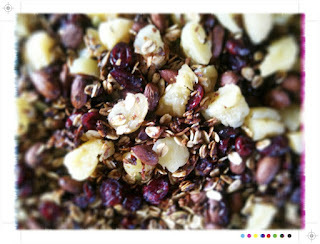 Let the granola cool completely and then it can be stored in a tightly sealed jar for up to one week. Gotta say I was surprised to see butter mentioned in the original recipe - even I wouldn't think of putting it in my cereal! I do love granola...almost like pudding that you can have for breakfast (or lunch or dinner or a snack or indeed pudding itself :P) Love the sound of the pumpkin seeds and dried peaches, so delicious. Thanks for dropping by Eating Brooklyn and leaving a nice comment. I like your recipes and photos and am following. 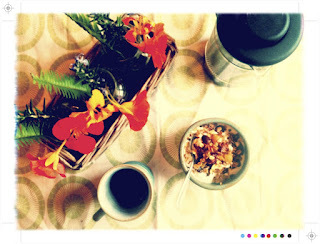 Nice to have a home made granola. So you say chips now? It took me years to stop saying crisps when I came to NZ! Always on the look-out for new granola recipes! Thanks! one way to start up the day! yum! This granola has all ingredients I love - sounds so delicious Mairi!